To Yorozuya Okagesan in Yotsuya. This place is known for winning the first one star Michelin as Izakaya style cuisine last year. with Akihiro san (@akihiro309) I met on Twitter, and his Sake friends. Kameizumi. Junmai Ginjo Kassei Sparkling Nigori (from Kochi) was the hit. You cannot ever find sake like this sparkling bomb! Sea bream with Karasumi, dried mullet roe. all sashimi need no soy sauce. Hidakami, earthquake restoration sake (Miyagi). 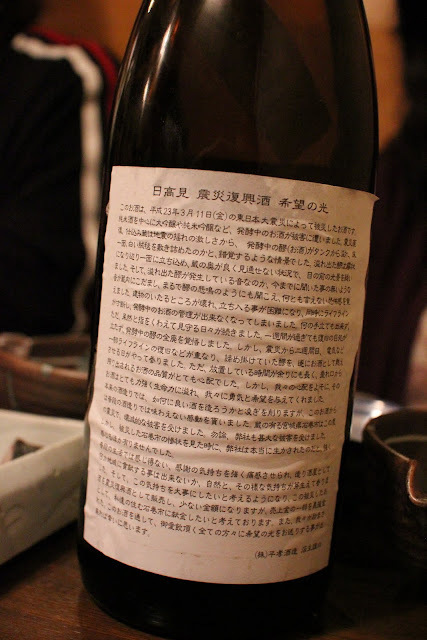 This sake is a shine of hope made by Moromi mush survived from the 311 earthquake. I am not just saying this, but it was delicious. Raifuku, Honjozo (Ibaraki). we enjoyed it warm. and Today's strangest choice. Shinigami (means Reaper...) by Kamofuku brewery(in Shimane). but it actually tasted very unusually interesting.